I had some trouble finding a logo that I thought needed serious redesigning. This was actually my 6th logo I attempted to redesign. Honestly, I didnt think the original logo wasnt hideous, but I did feel that it was behind the times. At first I wanted to change the serif, western inspired font to a thick, sans serif, simple sleak font to modernize the brand. After trying different ideas, I ditched the simple idea and went grundge. I found a font I was happy with online and went with it. 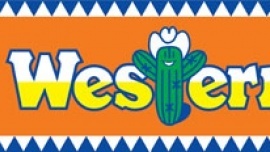 After tweaking the colors a bit, and creating a modernized vector version of the cactus logo, I created my own Western Beef logo redesign.